Response Templates for Microsoft Outlook (works with Microsoft Outlook 2003, 2007, 2010, 2013, 2016, 365) is an intuitive addin that allows you to create and store email templates used for replying to frequently repeated email questions with a single click. Using an easy to retrieve folder storage system built into Microsoft Outlook, Response Templates enables you to easily find and insert the items you need (including text snippets, sentences, paragraphs, URLs, attachments, etc.) into your emails. 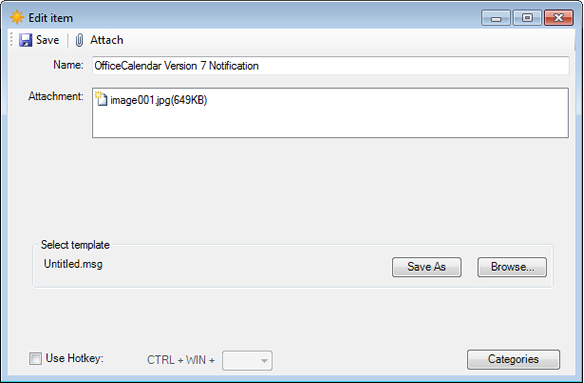 Using drag-and-drop or by simply double-clicking on the stored item, it will be automatically inserted into the active Outlook email window. Moreover, Response Templates can also be used when sending new messages or for adding information to forwarded emails. Works directly inside Microsoft Outlook 2003, 2007, 2010, 2013, 2016 and/or 365 (not an external application) so that you can Reply, Forward or Create a new email messages with the click of a button. Create “Insert Text” templates that include formatted text, hyperlinks, attachments, etc. 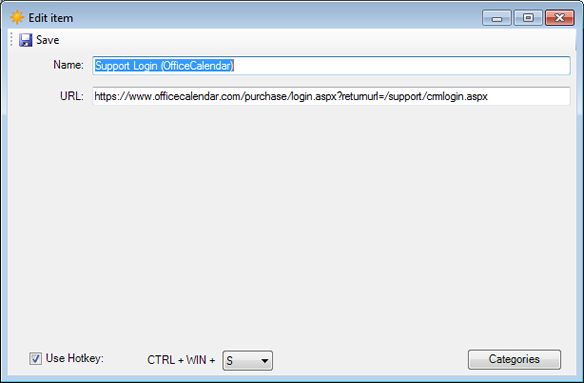 Create list of organized website hyperlink URLs to insert anywhere in an Outlook email message. 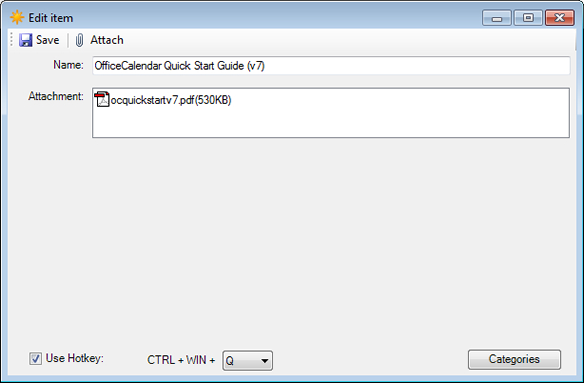 Create a list of attachments (documents, images, and other files) to insert anywhere into an Outlook email message. Create HTML email templates using Outlook Message File format for new email messages. 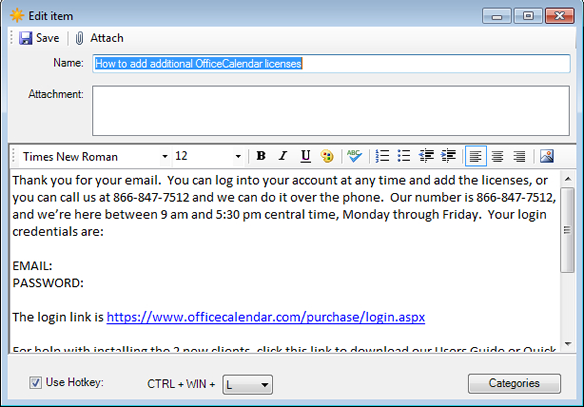 Easy to use slide-out/collapsible email template panel built directly into the Microsoft Outlook Message Window with one-click expand and collapse. Assign Hotkeys to Insert Outlook email Templates for faster mouse-less inserts. Assign and organize Microsoft Outlook email templates by categories helps you can quickly find the correct email templates. 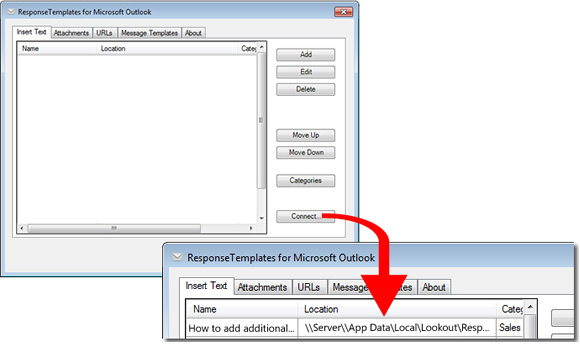 Connect to other user’s Outlook email templates over a network. 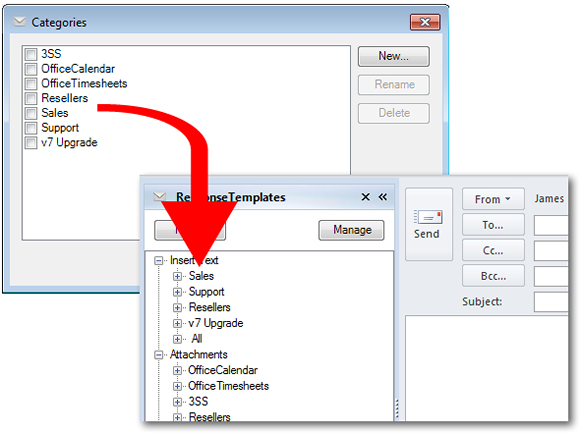 Response Templates for Outlook several types of email template types (when creating a new email, replying to an email or forwarding an email). 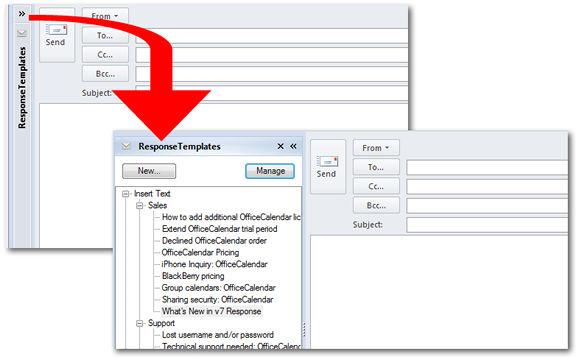 Response Templates can be used individually or you can insert a combination of templates into your email responses. 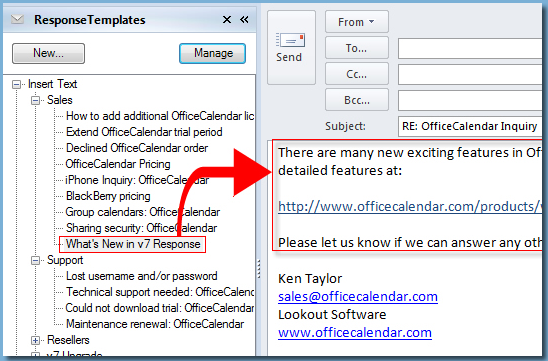 Insert Text Outlook email templates can include a combination of formatted text, URLs, images and/or attachments. Because Insert Text email templates can include all of these things it the most versatile insert template type. URL insert templates are frequently used web URLs that you may need to reference and/or insert to your email messages. Attachments insert templates are frequently used files/documents (product brochures, forms, etc.) that you may need to reference and/or attach to your email responses. Outlook HTML email templates (Outlook message templates) are primarily used for composing new email messages. Outlook Message Templates are email message created using Microsoft Outlook and saved in the .MSG or .OFT file format. This type of template would typically be used for sending highly graphical emails like new product announcements, customer newsletters, monthly sales promotions, etc. Response Template’s intuitive slide-out/collapsible email templates panel allows you to quickly open, view and insert Outlook email templates when you need them. The panel can also be hidden with a single click when you don’t need it so it stays out of your way. Response Templates allows you create categories, which enable you to easily identify and group your templates. More than one category can be assigned to a given template. Some multi-user sites may only want to create Microsoft Outlook email response templates from one computer and have all other users connect to a central repository of shared email response templates. For this type of situation, ResponseTemplates will allow you to connect to templates created by other users assuming they’ve shared and given you access permissions to the folders where their templates are stored.